The advancement in media and entertainment through photography has attained a new height the moment such a super-fast camera that could capture light was brought into the market. The dream of every photographer has been given a new life and meaning. Scientists have developed a super- fast camera that can film at an unprecedented rate of five trillion images per second, fast enough to visualize the movement of light. The camera will be able to capture incredibly rapid processes in chemistry, physics, biology and biomedicine, of which there has not been any much record of such occurrence in film making, researchers said. The Fundamental constant that represents the speed of electromagnetic radiation in a vacuum and equals approximately 2.9979 × 1010centimeters per second which is the speed of light, possibly a good spectrum of this packets can now be made graphic. A research group at Lund University in Sweden successfully filmed how light – a collection of photons – travels a distance corresponding to the thickness of a paper. In reality, it only takes a picosecond, but on film the process has been slowed down by a trillion times, which is very advanced compared to the on sight lab record. Currently, high-speed cameras capture images one by one in a sequence, filming 100,000 images per second. The new technology called Frequency Recognition Algorithm for Multiple Exposures (FRAME) is based on an innovative algorithm, and instead captures several coded images in one picture. This means that it could distinctively give a significance to each image even when incorporated within the frames of another copy. It then sorts them into a video sequence afterwards. 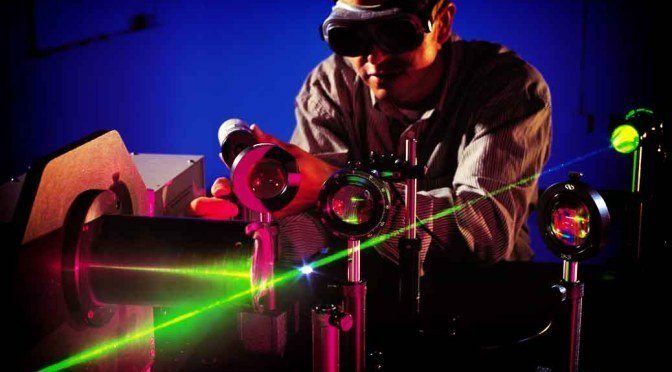 The method involves exposing what you are filming (for example a chemical reaction) to light in the form of laser flashes where each light pulse is given a unique code. The object reflects the light flashes which merge into the single photograph. They are subsequently separated using an encryption key. The film camera is initially intended to be used by researchers who literally want to gain better insight into many of the extremely rapid processes that occur in nature. Many take place on a picosecond and femtosecond scale, which is unbelievably fast – the number of femtoseconds in one second is significantly larger than the number of seconds in a persons life-time. “This does not apply to all processes in nature, but quite a few, for example, explosions, plasma flashes, turbulent combustion, brain activity in animals and chemical reactions. We are now able to film such extremely short processes,” said researcher Elias Kristensson. “In the long term, the technology can also be used by industry and others,” Kristensson said. A regular camera with a flash uses regular light, but in this case the researchers use “coded” light flashes, as a form of encryption. Every time a coded light flash hits the object – for example, a chemical reaction in a burning flame – the object emits an image signal (response) with the exact same coding. The following light flashes all have different codes, and the image signals are captured in one single photograph. These coded image signals are subsequently separated using an encryption key on the computer. The industry will soon be laying hands on the future of photography, then even the lightest element on the scene of capture can be seen as natural as it is. Believing the information concerning this development will automatically lead to photo lovers like me to start saving up some bucks to keep a good device of such for myself.